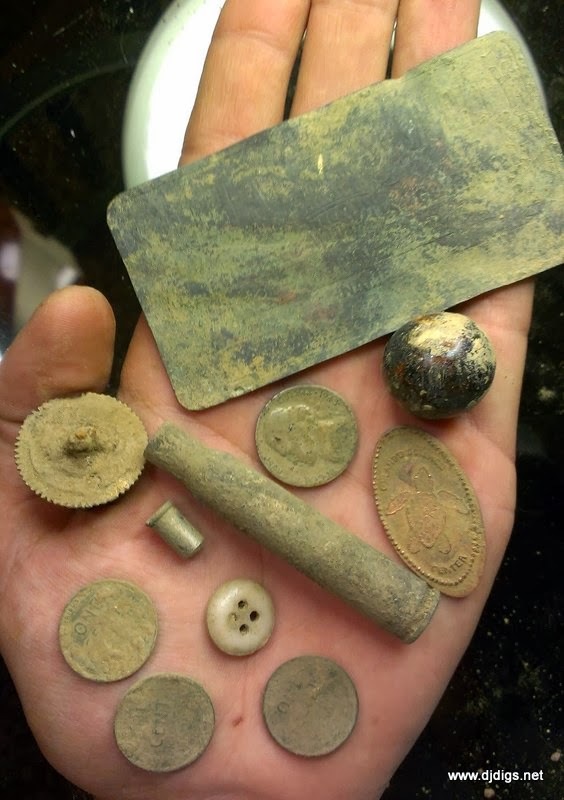 I had to work this morning, but I had the itch to get out and do some digging. I spoke to a friend who reminded me of a site I hit a long time ago. It was his mother-in-law's house and he said he would ask if I could do it again and he would get back to me. I had hunted this site before with the Prizm, so I was hoping to find deeper coins with the MXT. As soon as I turned on my machine, I remembered that even with the Prizm, I thought something wasn't right with the ground conditions here. This site borders and is on one of the historical landmarks in our area. It goes back to early Colonial activity. The house itself was built later (probably in the 20's) but the land is much older. I'm pretty sure fill dirt was brought in to create a yard at some point for about a 50' perimeter around the house. I could tell because the dirt was filled with clay and small rocks. The soil on the rest of the property was much different. As I moved out of the fill and onto original grounds, it seemed to be highly mineralized. I just couldn't get my machine to run smoothly. 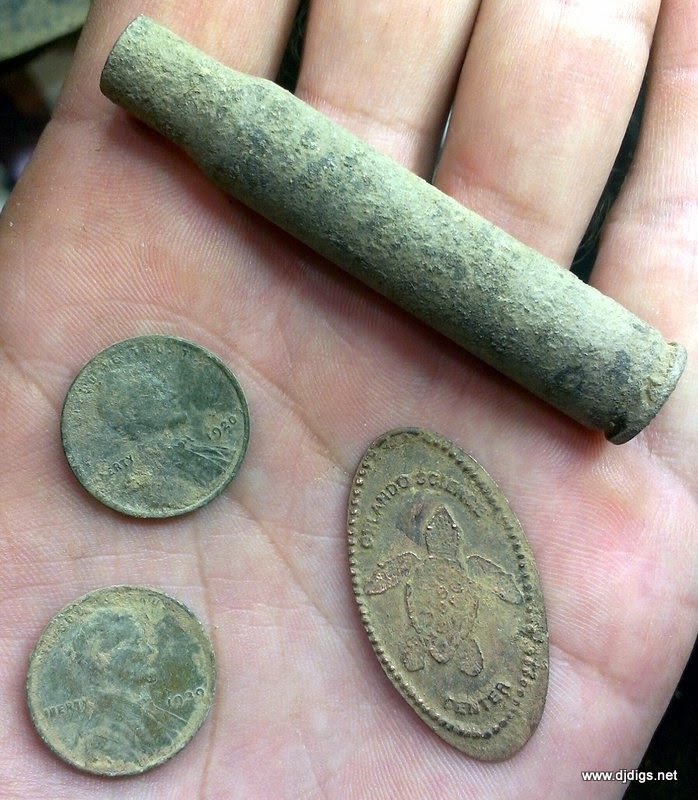 I put in a good hour, maybe an hour and a half, and I managed to come up with a 1920 and a 1939 wheat penny, a smashed penny that says "Orlando Science Center" and has a turtle, and a rifle casing from a bullet shell. As I was leaving, I noticed the next door neighbor was outside. He lives in one of the actual historical homes. I pulled over and introduced myself. He turned out to be a really nice guy, who seemed to be interested in what I was saying. Then he told me that HE actually has a machine, but he hasn't had time to get out and use it! I asked for permission and offered for all of the finds to stay with the home, and he said he would get back to me. I also offered to help him use his machine. 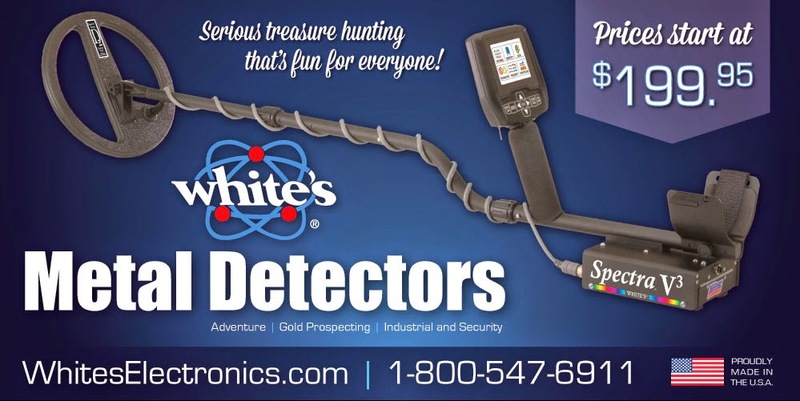 (If it works out, that would be a really neat hunt!) I don't want to get my hopes up, but I'm looking forward to it. Since I had a go-to site in town, I wanted to head over to Anthony's. Once I got there, I tuned in my MXT and started playing around with different settings. I started with the previous hotpots, but I only came up with a few pieces of trash here and there, so I decided to work my way back to the dirt mounds. 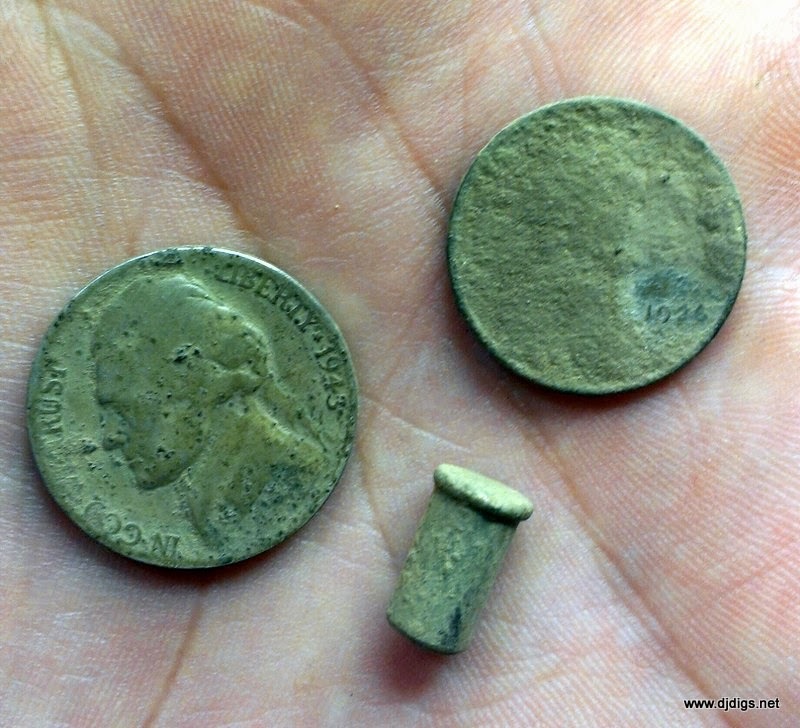 On the way there, I hit a real jumpy signal and pulled out a wheat penny next to an iron nail. It was actually one of those headphone-blowing overload tones. It turned out to be another large horseshoe. I felt that I'd cleaned out the exposed dirt areas to the best of my ability, so I decided to hit the front yard, where no construction work was being done. The house sits on a major road, so there were a lot of trash signals including can slaw, bottlecaps, and aluminum foil. But out of all that, I still managed to come up with a 1943P war nickel. On my way home, I noticed another construction site, on a home that was being completely remodeled. This home dates back to the early 1900's, so I HAD to stop. I introduced myself and got the go-ahead, with a forewarning that they'd dug up a lot of trash in the yard. I turned on my machine and it didn't take long to see what they meant. I stuck it out for a while, but I dug a bunch of trash. 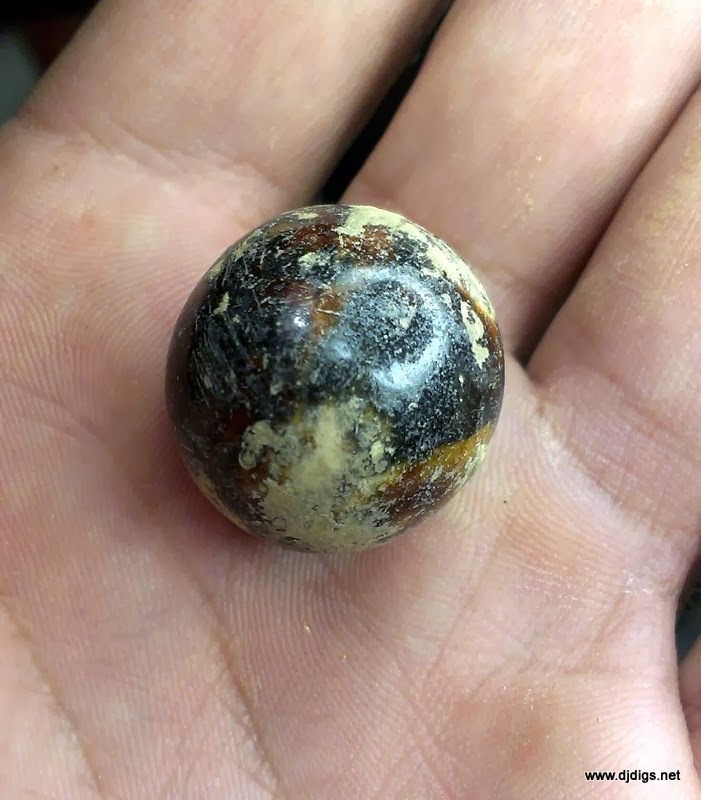 And in the midst, I kicked up a really cool handmade oversized marble. I few minutes later, I uncovered a rectangular piece of metal. It looked blank and I put in my scrap pouch. I really wasn't coming up with much other than trash, so I worked my way back to my truck. 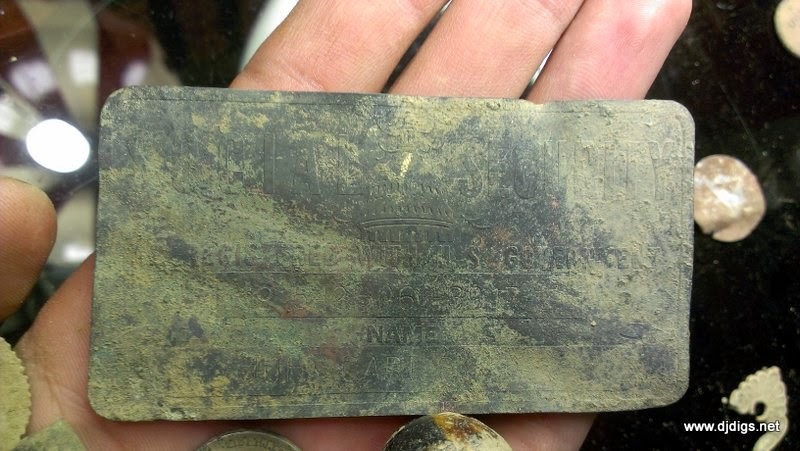 As I was going through my finds, I discovered that the metal piece had some type of writing on it. 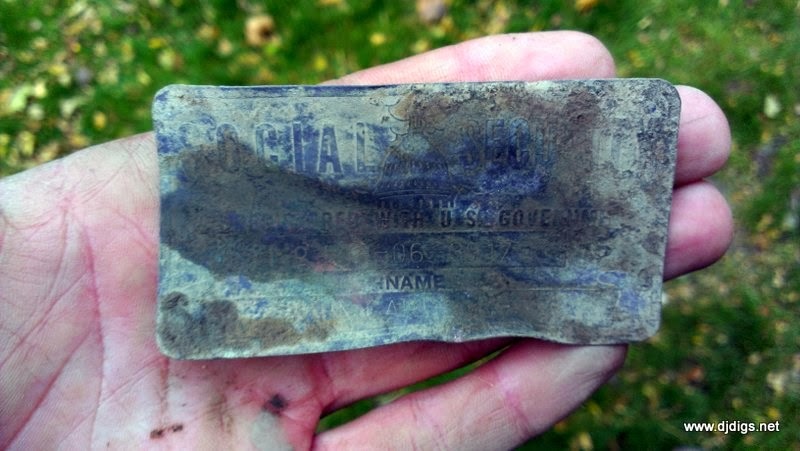 I grabbed a bottle of water to clean it off and realized that it was a completely awesome find! 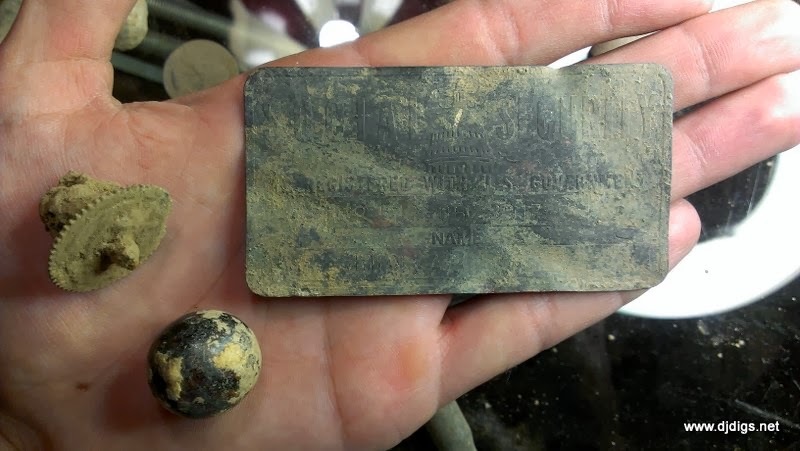 It turned out to be an old metal social security card. Date to be determined. To think, I might have thrown this in the scrap bin! So far, I can read the social security number itself and a partial name of who it belonged to. I'm working on getting a complete ID and doing more research. I went back and detected for another half hour, just to be sure I didn't miss another great find. Nothing but trash, so I decided to call it a day and head home. Today turned out to be a really fun day. I caught up with an old friend, I gained a potential new site and hunting partner, and I found some exciting relics.